The awesome SUPERBOWL 42 > Eli Manning made me a fan with that awesome play... escaping the sack and firing the ball for one of the best catches I have ever seen. SUPER TUESDAY > Obama & Clinton winning states and keeping the race tight. Tornadoes > Watching the news and hearing of the devastation and loss of life - my prayers were/are with the mourning. Work was good... we did what needed doing... and the recreation was sweet - food and drinks with my colleagues... finding some space on my own > coffee in Barnes & Noble... hunting in the Mall (the $5 shop RAWKS!!!)... 3am video iChats with my VIPs in Motherwell... gaining the confidence of driving in the US... on my own... without GPS. I'm knackered and am suffering from the lack of humidity (itchy skin... bleeding nose etc) but glad to be going home. I have enjoyed being with my colleagues and have seen some amazing sights / picked up some cool stuff... and sorted out my head. I am glad to be going home to Olly, my VIPs, my friends and my space. My only regret is not getting to hang with Johnny Laird's pals > Taff and Nicky (Sorry guys... but I never got a chance). I didn't get to see some of the places I wanted to see in Manhattan... but I saw plenty more to compensate. Its been good. Thanks to everyone who sent mail, texts and facebook hollers. 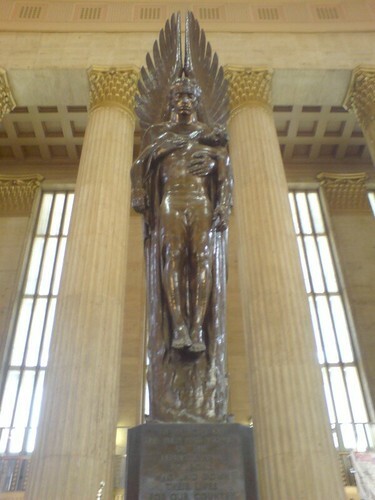 I'm on my way home... via the 30th Street Station (see pic) in Philly and Newark International Airport.